This script downloads epg (electronic programme guide) from different servers (wget). Compresed *.gz . auto extracts and renamed to tvguide.xml use it on XBMC/Kodi and Media Portals. You can edit, change and add different server in bat files. Please do not run more than once a day. Rytec Sources (xmltv_epg_graber.zip) no longer works. Download to our new tool webgrab+plus auto downloader. out gamy prize piece of writing ilk yours present. I candidly appreciate individuals alike you! Sometimes server doesn’t work, such as uk/es, if you find working epg sources, you can also use with script. Open Rytec Greece XMLTV.bat file with notepad and add your server. Bat file is a executable tool for download to epg data, if you downloaded to epg you have to show file path over network. Now working Italy, and other sources updated! Download the latest xmltv_epg_graber.zip thanks for your alert. How long do I have to download the XML file? After a few days lost everything, even if I update the EPG is not working. Hi, unfortunately, you have to repeat the same process. I updated source files, you can download again. When i run denmark xmltv i get the tvguide file and it works flawless however its not in danish but swedish/norway is there a way to change so it get info in danish instead? Hi, rytec has combined the source to nordic channels, no exclusive source for now. Is there a way to watch Scuzz TV (UK Music Channel). Grabber works great for uk epg, is there any chance of extending the epg longer than 2 weeks? Is that some EPG addon, displayed in the first picture up on this site? Thanks for your job . I have done a batch for testing the links of the repositories . Result : 1 , 4 , 5 are down . rem On lance le telechargement de l’EPG à partir de 5 sites . rem on obtient : rytecxmltvFrance1.gz à rytecxmltvFrance5.gz . Only ‘openvix.co.uk’ and ‘xmltvepg.nl’ are working . Script already getting data from openvix.co.uk as default. Thank you for your detailed review. Does I have to only consider ‘openvix.co.uk’ and ‘xmltvepg.nl’ are the only available links ? Or will you give us other ( more ) links . It’s enough for me at the moment . today do not download anything. Do you agree? Hi, it’s fixed download again. These grabbers create an enormous amount of traffic on our servers. Use the Jin plug-in which is properly configured for downloading the files. We do not develop that graber and orginal project is four years old it has many users found on http://forum.team-mediaportal.com/threads/crossepg-rytec-graber-epg-for-mediaportal.113561/. We examined tiny.cc stats it’s not show unusual traffic from us and Kodi not getting to EPG with any plugin or addon. Please send log files to info@iptvsaga.com let’s look at what we can do. Crossepg as downloader for the EPG should be fine. But we see a tremendous amount of downloads from Kodi. if you have an m3u playlist of 50 channels, it will/should request the epg file max 50 times. Still i don’t think it’s about us but now deactivated on KODI. It’ s unbelievable traffic, please accept our apologies if it from us. I host one of the servers for this epg data, if this happens again I’ll be pulling the hosting. Caused us a lot of headache yesterday and it’s not the 1st time we been forced to move the EPG hosting. This is the last time I’ll move it, if happens again, I’m done with it. Why don’t whoever created this script put their hand in their pockets and buy their own server to host this data for this script! You i**** are *** killing this service for everyone with your badly written script! I just found your great grabber.. Thank a lot, I really missed this tool. However I ran into a problem. This doesn’t happen on stationary computer with Windows 10. I get no xml-file.. What can I do? if it doesn’t work, open to command prompt as administrator and go to directory where is bat files located. It should work, also you can convert to bat files to exe. Sorry to say that the xml obtained not work on my TV DVBLink Server. Only shows the schedule for four or six channels. any idea what i am doing wrong ? 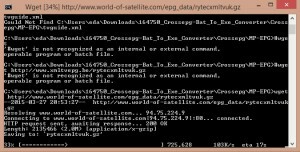 it seems XMLTV EPG Graber Batch Script do not work anymore. i tried all the bat file in epg garber, however, no epg was downloaded. Yes, unfortunately it doesn’t work because of rytec servers are offline. We will update the tool when we find working sources. It’s now updated, you have to download new tool or you can build your own epg with that tutorial.